Consider planting drought resistant plants in your container gardens, especially if watering is a concern. Most of us live in areas that face drought conditions at some time during the year. Many of us live where water use may be restricted at times. Long stretches of high temperatures and heat warnings are not uncommon in the summer months. Most drought resistant plants can also tolerate heat. A waxy coating on the plant’s leaves slows down water loss, like the leaves of the ivy-leaved geranium. Plants with taproots, like butterfly weed, are generally drought resistant. Below, from left: Lamb’s ear, geraniums, portulaca, butterfly weed and ivy-leafed geranium. Coneflower – I have used and loved coneflowers forever – they were probably the first perennials I planted in my sandy soil – in full sun. And now I use them in containers – they do well. There are a few different colors, including white, pink and purple. They bloom most of the summer. Coneflowers can grow to 2 feet. Perennial flax – these flowers are a deep blue – they open and bloom during the heat of the day and close up in the evenings. Flax can grow to heights of 2 feet in full sun. Butterfly weed – the taproot of this plant makes it drought tolerant. Colors include white, orange, purple and yellow. It will grow to 3 feet in containers. As its name says, it will attract bees and butterflies to your gardens. Globe thistle – this thistle has blue, globe shaped flowers and can grow 2 to 3 feet tall. Others to try are lavender, yarrow, hyssop, evening primrose, gaillardia and garden sage. See the Perennials page for more of these plants. Lantana – my sister says this is all she can grow because she doesn’t get her hanging baskets watered enough. They hang on a westerly facing deck and get lots of sun and heat. Lantana comes in yellow, red, orange, white, pink and lavender. It comes in both upright and trailing forms. Dead head the plant to encourage blooms all summer long. 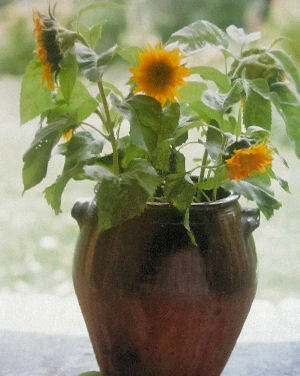 Sunflowers – colors range from white to yellow, orange, or red. Some have one big flower and others have several blooms on each stalk. Zinnias – Mexican zinnias grow 8 to 12 inches tall. Look for zinnia augustifolia or zinnia linearis. Common zinnia is also good in dry, hot conditions. They are bright, showy flowers in orange, yellow and white. Zinnias are easy to start from seed. Geraniums – one of my regulars for showy color and ease of care. Both pot geraniums and hanging geraniums do well in dry conditions. See the Annuals page for more of these plants. Many succulents are drought resistant plants. Find out more about using them in container gardens. Lots of shrubs are drought resistant plants and do well in containers. Spirea blooms in early spring with lots of white flowers and its leaves turn yellow-orange in all. I prune mine to keep it nicely shaped. Bluemist spirea is a pretty shrub with blue flowers in August and September. Cut it down to ground before winter to insure growth and blooms the following year. Oregon grape is a lovely shrub with blue-green leaves and yellow flowers in spring. They will grow to about 3 feet tall. 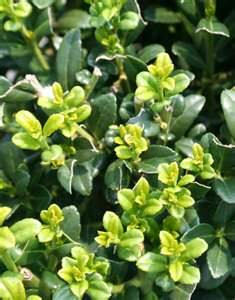 Japanese holly is a small leafed evergreen. If you have a female plant, it will bear little black berries. It’s foliage is very nice and it needs almost no maintenance. To the left is the “Sky Pencil” variety of Japanese holly. Cranberry cotoneaster is low-growing with small, shiny leaves. It gets covered with cranberry red berries. Sand cherry shrubs are very easy to grow – one of my first shrub plantings. 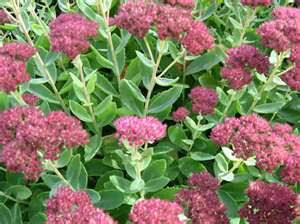 They get lovely pink lowers in spring and have a burgundy red leaf the rest of the summer. Bristlecone pine is a slow growing evergreen. It has a bluish cast to its foliage and is a good focal plant. Serviceberry trees have pretty white flowers in spring, and its gray bark is always attractive. See other Trees and Shrubs for containers.